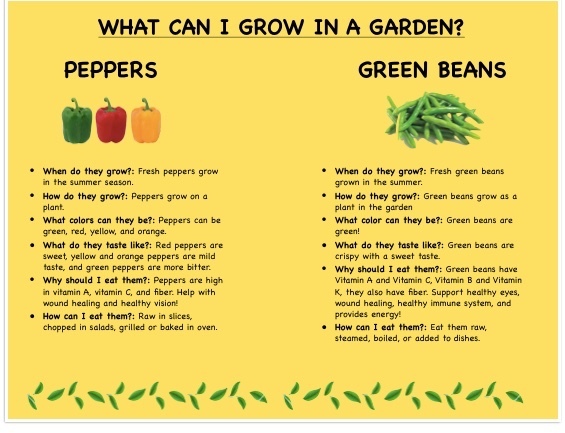 Teach children ages 4-18 years old about nutrition basics by involving them in real life gardening and harvesting different vegetables, fruits, and herbs. Discuss the roles of vitamins and minerals in the body, teach them about the differences in taste and smell, how vegetables and herbs can be used in recipes. Nutrition information for 8 items: peppers, green beans, zucchini, strawberries, rosemary, chives, thyme, and basil. A fun interactive activity where they can plant a seed at home and watch it grow in a few days, kids love it! Best target populations: use in children’s hospitals, school nutrition, community nutrition, kids at home.